What is the EVIL EYE? Wikipedia has a concise explanation: "The evil eye is a curse or legend believed to be cast by a malevolent glare, usually given to a person when they are unaware. 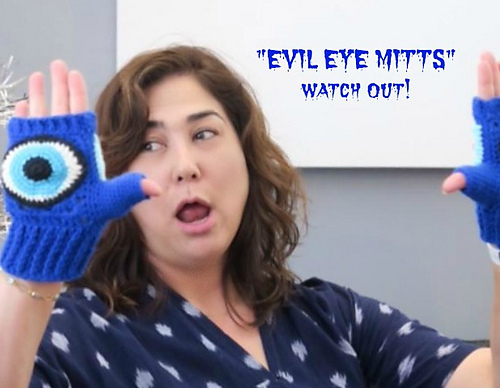 Many cultures believe that receiving the evil eye will cause misfortune or injury. Talismans created to protect against the evil eye are also frequently called "evil eyes." The Evil Eye is also an act of protection. But it is not just defensive, it is also an act of aggression, of willful gazing, of not turning away. This particular glove is a modified version of the "Evil Eye Glove" by Kat Coyle and promoted by Krista Suh in honor of those killed in the Parkland, Florida school shooting. These gloves were worn for the March for Our Lives in Washington, D.C. on March 24, 2018, as well as for other protests and marches against gun violence. I see it as a STOP to whatever you happen to be against that day. The eyeball is on the inside of the glove so you can hold up your hand in the stop gesture. 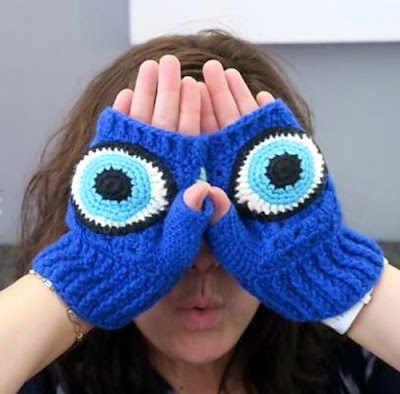 Kat's pattern is knitted. 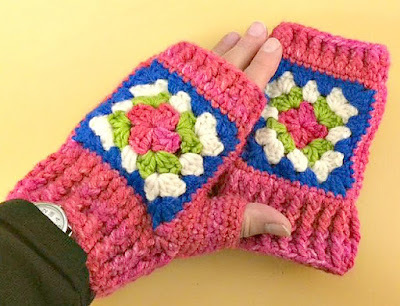 I saw a lovely little granny square mitt on Instagram by @cicibiciorgu. The photo was tagged for a group I follow called Granny Square Therapy. Since all the info was in a foreign language, I could not find a pattern, so I enlarged the photo and figured it out! 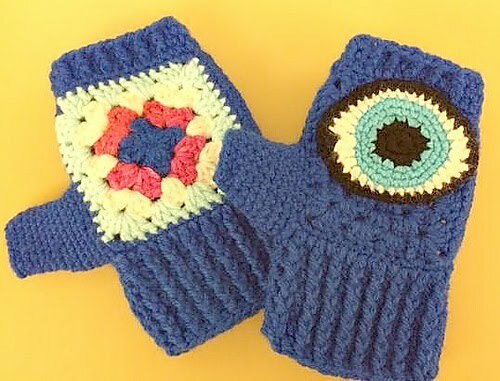 The pattern for the eyeball applique was found here. 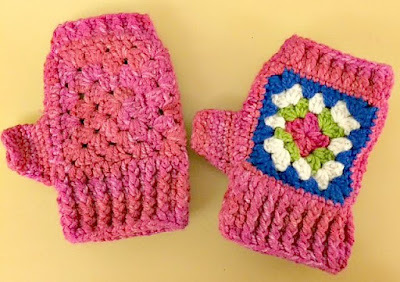 I liked these gloves so much, I made a pink set for myself, sans the evil eye! Natalie can be rather dramatic at times! I'm glad she likes her mitts.